Survivor: Heroes v Healers v Hustlers (2017) - 4th place, 15th out - 8th juror. Eliminated by fire-making in Episode 14, "Million Dollar Night" (Day 38). Heroes v Healers v Hustlers Ep. 1 IC: "Tracks of My Tears" - Works table maze with Ali; Hustlers don't lose! (2nd*/3). Heroes v Healers v Hustlers Ep. 2 RC/IC: "Crossroads" - Dives for all three puzzle piece bundles, but Hustlers lose (3rd/3). Heroes v Healers v Hustlers Ep. 4 RC: "Tangled Up" - Now with new Levu, waits to work the puzzle; Levu loses. Heroes v Healers v Hustlers Ep. 4 IC: "The Color and the Shape" - Hauls, woHeroes v Healers v Hustlers Ep. 8 RC: "Air Raid" - Hits the first target, but the red team loses.rks the puzzle; Levu loses again (3rd/3). Heroes v Healers v Hustlers Ep. 5 RC: "Head Long Flight" - Shoots the 5 baskets at the end, and Levu wins! (1st/3). Heroes v Healers v Hustlers Ep. 5 IC: "Rice Race" - Carries the rice, places the second ball; Levu doesn't lose (2nd*/3). Heroes v Healers v Hustlers Ep. 6 RC: "A-Tension Span" - Moves the boat, takes a few slingshots; Levu loses (3rd/3). Heroes v Healers v Hustlers Ep. 8 RC: "Air Raid" - Hits two targets, and the blue team wins! Heroes v Healers v Hustlers Ep. 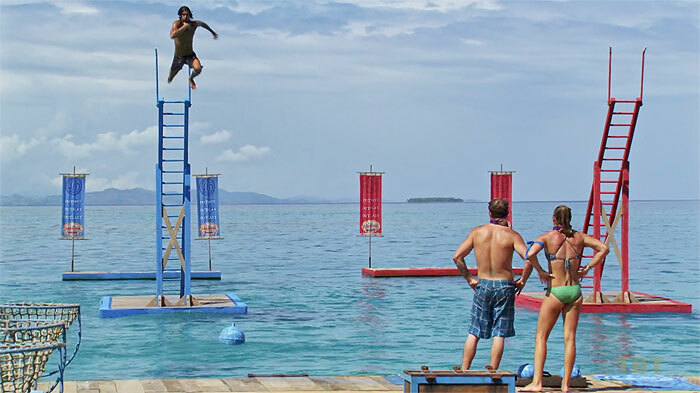 9 RC: "Hear About It Ladder" - Climbs the ladder, retrieves a buoy; but his team loses. Heroes v Healers v Hustlers Ep. 11 RC: "Kenny Log-Ins" - Helps paddle, haul and shove logs, blue team wins! Heroes v Healers v Hustlers Ep. 13 RC: "The Bottom Line" - With Chrissy, takes the lead on the ring toss, team wins! Heroes v Healers v Hustlers, Ep. 7 IC: "Will It Go Round" - Sixth person to drop out (7th/12). Heroes v Healers v Hustlers, Ep. 8 IC: "Ten Foot Pole" - Third person to drop out (9th/11). Heroes v Healers v Hustlers, Ep. 9 IC: "Squatty Probst" - Fourth person to drop out, fairly quickly (7th/10). Heroes v Healers v Hustlers, Ep. 10 RC: "The Game is Afoot" - Has one block on the top layer, doesn't win (6th/9). Heroes v Healers v Hustlers, Ep. 11 IC: "Driving Wheel" - Placing letters in final word, barely loses (tie-3rd/8). Heroes v Healers v Hustlers, Ep. 12 RC: "Love on the Rocks" - Devon & Sonja are eliminated in first round (tie-3rd/7). Heroes v Healers v Hustlers, Ep. 12 IC: "This Much" - Negotiates with Ashley, drops out to take second (2nd/7). Heroes v Healers v Hustlers, Ep. 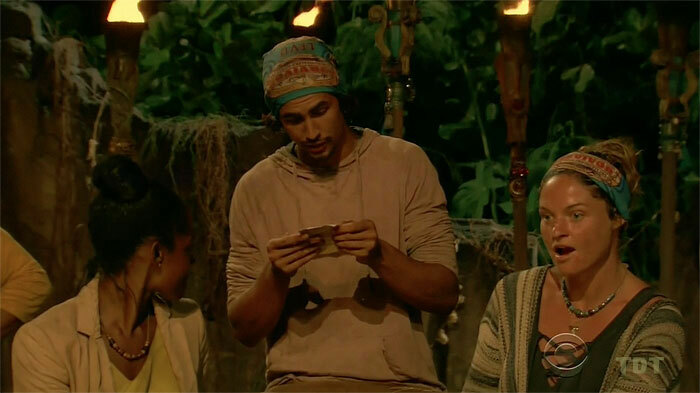 4: Jessica plays the vote-block advantage against Devon, and he does not vote. Heroes v Healers v Hustlers, Ep. 14, F5 vote: Mike Zahalsky (idoled out, -1-1; 2-1 on re-vote). *Devon attended the Ep.4 Tribal Council, but was blocked from voting (thus not counted). Heroes v Healers v Hustlers, Ep. 14, F5 vote: One vote, from Ben. Heroes v Healers v Hustlers, Ep. 14: Voted for Ryan Ulrich (who finished third, 5-2-1). I got an advantage! This is so great. Final block placed: Levu doesn't lose! Lauren's good! Almost as good as me! Just dared Ben to play his idol. He did. Who isn't a bartender, really? 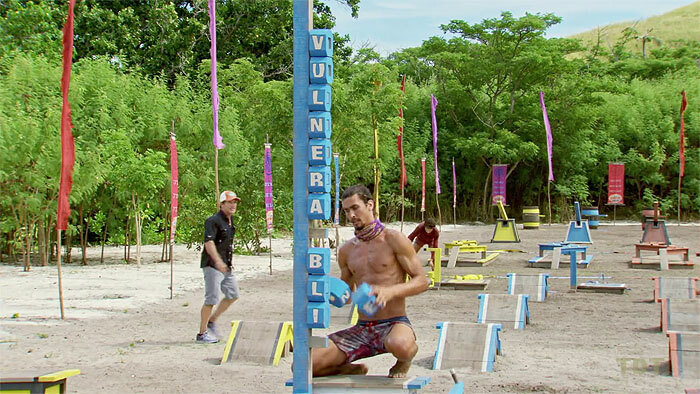 Josh Wigler at The Hollywood Reporter (9/19/17): "Player Profile: Meet Devon Pinto"
Dalton Ross at EW.com (12/21/17): "Devon says 'nothing in Survivor is fair'"
"What's your personal claim to fame? I am most proud of the man I have become today from being on my own since graduating high school, accomplishing the things I have, and living wild experiences. My guitar so I can serenade everyone, my surfboard so I can pass the time riding perfect untouched waves, and champagne to celebrate all the Immunity Challenges I'm going to win for my tribe. I think playing Survivor would be the most satisfying accomplishment and winning would be even more satisfying! I have this itch to play the game that just needs to be scratched! When everyone is too busy either loving me or underestimating me, I am going to be picking them off one by one until I am the Sole Survivor! Every single Immunity Challenge is mine. I will have everyone's vote at the end because they all will love me so much."